Numerous hurricane hunter flights began today, and continuous around the clock hurricane flights begin tomorrow. They are monitoring Tropical Storm Erika, and that is what you should be doing if you are watching this as well. The next flight will be during the overnight hours, and the global hawk will be flying a 24 hour flight beginning tomorrow morning. The Global Hawk is a remotely flown hurricane drone that will fly above 55,000 feet and do dropsondes throughout that flight. NOAA, NASA, and the Air Force will ensure that we don’t miss a thing. Without any other immediate threats, I will be focusing on Erika tonight. It became apparent this afternoon that Erika remains unstacked, even in the lowest 11,000 ft. Microwave imagery supports this with a low level center about a half degree north of the flight level -10kft- closed center for the P3 aircraft. If you look at the chart below and the full tropospheric vertical wind shear map, it becomes clear that the anticyclone (or upper level high pressure system) has become dislodged to the SW as noted by the clockwise spin in the streamlines. Those streamlines suggest a possible reason for the tilting down toward the south, although this is a wind shear and not a direct wind that would push a system off tilt. Gonzo did show some higher 500 mb winds on the western side. This could also explain the lack of a good outflow channel to the north. A slower movement at all layers may help organize and stack this system. This tilt will keep Erika from readily intensifying even with otherwise good atmospheric conditions. Some dry air may have been ingested this afternoon, but the flight this afternoon suggests only modest dew point depressions. Oceanic favorability will increase over the next couple of days as Erika moves over ever warmer waters. Erika is likely to pass just north of Danny’s original path if it stays weak. This path could be slightly north of the islands with a stronger storm. This is essentially the same model game that we were playing with Danny a few days ago, but do not dwell on that. Every storm is different. History does not copy and paste its pages. Shear could temporarily add times of weakening over the next 24 hours, but as water temperatures warm in Erika’s trajectory, slow intensification is likely. 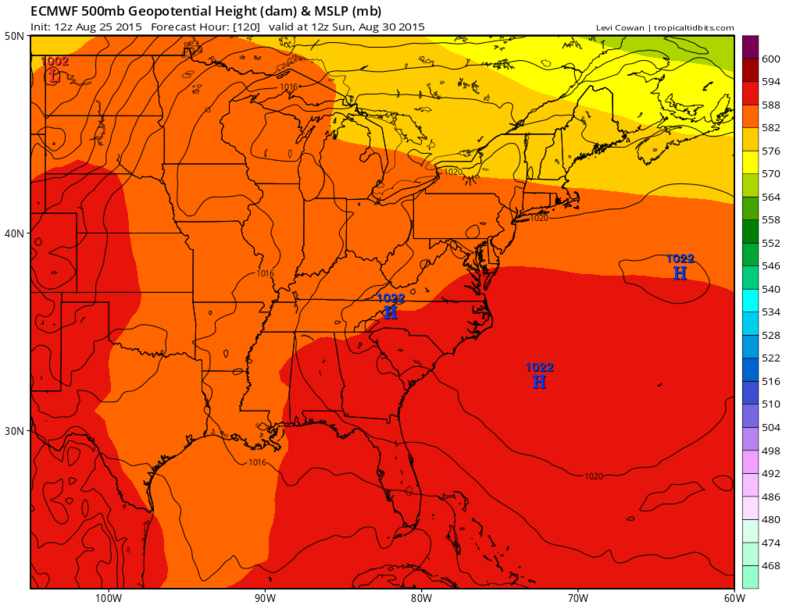 Interesting to note that the 00z SHIPS models now suggest weakening for a time likely due to high shear. Tropical storm warnings are likely from Dominica to Saint Maarten with tropical storm watches expanding west from there. I have posted the current NHC forecast above as a best guess. As the NHC has noted before, the last two to three days of their forecast and mine are of substantially low confidence due to land interaction, the lack of steering currents, and a potential for mid-latitude interaction. The first of those sources for uncertainty can be seen above. As with Danny, if Erika remains weaker than currently forecast, as the GFS shows and this afternoon’s Euro shows as well. Euro did a significant flip flop in the last 24 hours, and could easily go back the other way. A much weaker system will be more likely to be closer to the left side of that cone and closer to land. A stronger system is more likely to be to the right of that cone. Possibility 2 – Above is the 12z European Model. I have suggested earlier that this model has flip flopped and may continue to do so earlier…so why show this now? Because it still shows the puzzle pieces that will come into play. The above is the mid-level of the atmosphere in color, and the resulting surface pressures. Note that at the surface, there is a tropical wave crossing through the Florida Straights or south Florida in the form of a squiggle and a surface high pressure system to the north and east. Aloft at 18,000 ft, I want to draw your eyes to the orange slot over the western Gulf of Mexico (A) and the orange ridge over the midwestern US (B). Point A is likely to be a somewhat cut off low pressure system that will be dropped off from mid-latitude flow. On the eastern side of that will be southerly flow toward the gulf coast. At point B, this ridge is sliding fairly quickly eastward toward southern Canada and New York State. This may help weaken steering currents aloft by effectively leaving Erika without a ride to the north. Winds over the Appalachians at 18,000 ft would be out of the northwest. Pts A and B could work together to weaken any steering. This is just one other possibility. The global models seem to be trending toward it. What would that do for Erika? Well, weaker steering flow could allow Erika to sit in one spot or slowly drift generally northward from wherever it gets left behind. How do we get to that point? Erika will be following the periphery of the Bermuda high toward the WNW or just north of west at times for the next three to four days. At that point, we may be talking about the possibility above. Third Possibility – If the hurricane models are correct, this system could fend off the mid level shear, dry air, and miss land altogether. A stronger system is more likely to be able to find spots between the puzzle pieces to go northward. This is called a weakness, and they often help protect the US from landfall. For the United States, this is very much a storm to monitor this week with every update. There is never a better time than yesterday to get your storm kits together and organized. If you are reading this as anyone who is impacted by daily sea breeze type thunderstorms, you know it only takes one thunderstorm to knock out power for a while. A storm kit is always a necessity even if it sits in a pantry for months without being touched. Posted on Tuesday, August 25th, 2015, in Tropical Weather and tagged Bahamas, Cuba, Dominican Republic, Erika, Florida, Hispaniola, Hurricane, lesser antilles, Puerto Rico, Storm Kit, Tropical Storm. Bookmark the permalink. Leave a comment.